Breakfast can be a bit of a struggle, with not a lot of time in the morning and the battle to avoid cereals that are high in sugar (Sorry Choco Squares, you have to go). It's taken me a while to find a healthy breakfast that I can make quickly in the morning, devour in seconds and to keep me feeling full all morning. 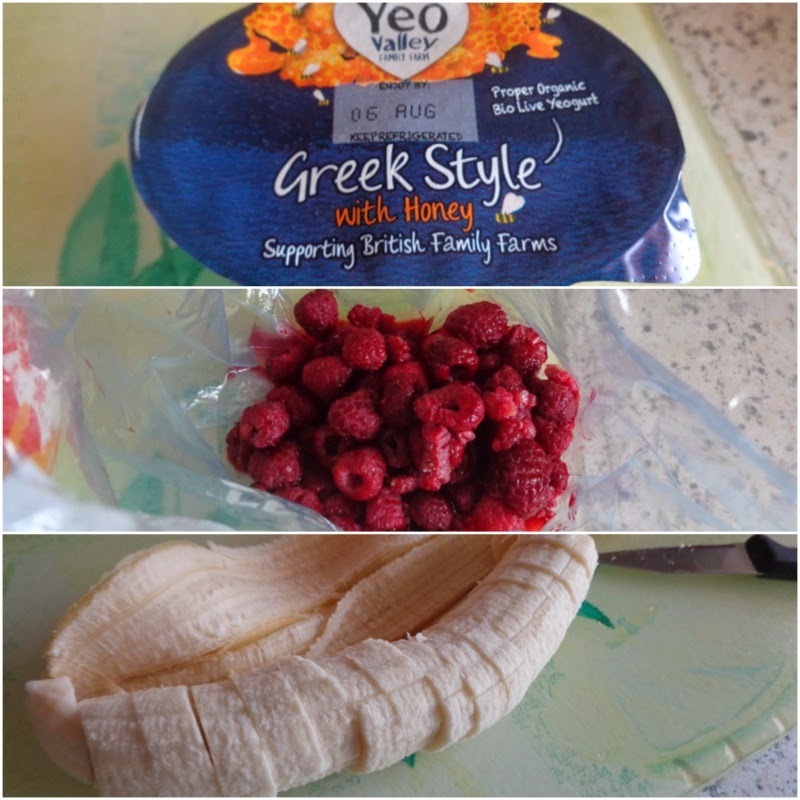 Yeo Valley Greek Style yogurt with Honey, Raspberries, Banana. I've tried a few different Greek and Greek style yogurts and the Yeo Valley Greek Style with honey have become my firm favourite. I prefer the individual pots to the big pots for 2 reasons, freshness and portion control. I buy frozen raspberries and blueberries because they are much cheaper and I don't have to worry about them going off before I get the chance to eat them. Once I've got the big trays of fruit home I get all of it bagged up into individual portions which I can pop in the fridge the night before for defrosted fruit ready to serve. Adding in a banana helped bulk out my breakfast, is one of my favourite fruits and goes really well with honey yogurt! Not the most beautiful looking breakfast but one that sets me up for the day. If I'm really particularly peckish I add in a bit of Strawberry Crunch cereal. What's your everyday healthy breakfast? What about your favourite 'cheat' breakfast?